'Night Moves' Leaves Too Much In The Dark In Kelly Reichardt's ultimately unsatisfying new film, three environmentalists plot to blow up a dam in an act of consciousness-raising eco-terrorism. 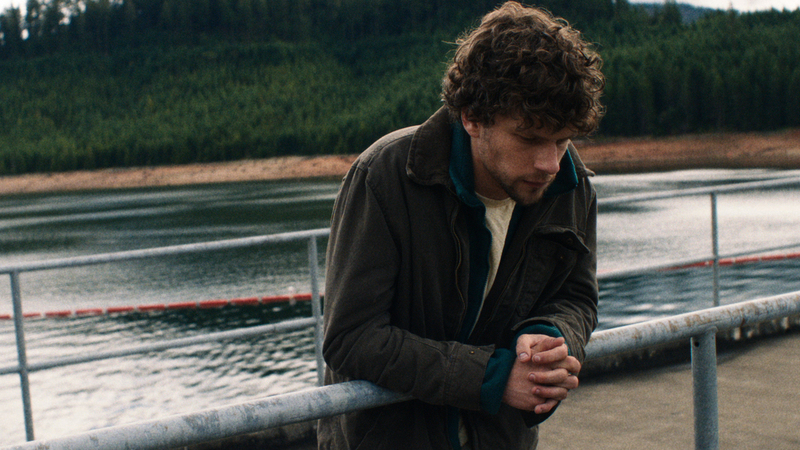 In Night Moves, Josh (Jesse Eisenberg) and two other partners in crime (played by Dakota Fanning and Peter Sarsgaard) plot to load a boat with explosives and blow up a dam in an act of consciousness-raising eco-terrorism. The natural world has never been the most hospitable place for Kelly Reichardt's characters. In Meek's Cutoff, a group of 19th century settlers nearly lose their lives while traveling west across the scorching Oregon desert. In Wendy and Lucy, when Wendy is forced to sleep in the woods after her car breaks down on the way to Alaska, she wakes up in the middle of the night to a deranged man talking to himself right by her side. Reichardt's characters have also tended to be defined by their rootlessness, whether it's the pioneers or Wendy searching for new homes across the country, the runaway lovers in River of Grass fleeing past lives in Florida, or nomadic Kurt aimlessly wandering the streets of Portland at the end of Old Joy. So it ought to be immediately suspicious that Night Moves, Reichardt's ultimately unsatisfying new film, portrays nature at first as a calm refuge and emphasizes the peaceful homes that its characters inhabit. Reichardt keenly observes these spaces — the spa that Dena (Dakota Fanning) works at, the idyllic farm where Josh (Jesse Eisenberg) lives — to the point that when Josh and Dena purchase a boat together, Reichardt has Josh enter the seller's home and, in a quick pan around his dining room and living room, lets us briefly relish in the comfort of his suburban life. It's all very quiet, very still, a standard mood for Reichardt that in this case slowly turns to dread as Dena, Josh and a third partner in crime, Harmon (Peter Sarsgaard), set in motion a plan to load Josh and Dena's boat with explosives and blow up a nearby dam in an act of consciousness-raising eco-terrorism. Reichardt, working with her regular screenwriting partner Jonathan Raymond, keeps us at a distance from the trio. That's true both literally — we watch many parts of their plan unfold through long shots, with unaware bystanders appearing in the foreground increasingly as the event nears — and morally. Night Moves doesn't doubt the basic rationale behind the trio's activism (this isn't a surreptitious case against environmentalism), but it's clearly skeptical about this particular cast of characters, whose motives turn out to diverge significantly or, in Josh's case, be nearly impossible to discern. So much is clear when Harmon reacts strongly to Dena's doomsday facts about the world's declining fish population. "Who says?" he asks, and then scoffs at her reply: "Yeah, well, maybe science is wrong." Ultimately, Night Moves is not overtly preoccupied with the future of the planet or the species. That's a topic too grandiose for Reichardt, who has always preferred to address politics through a focus on individuals and here zones in on a group of people who, while combating an urgent environmental crisis, may have become dangerously estranged from their society, isolated from the broader culture. Their homes and workplaces seem like sanctuaries to begin with, but later, in retrospect, come to feel like bubbles. And when Sean (Kai Lennox), the paternal, hardworking owner of Josh's farm, denounces the dam bombing as "theater," the underlying message is that there's more than one way to do right by the environment but only a few by which to do right by your fellow humans. Reichardt is one of the most talented, thoughtful American directors working today. But having watched Night Moves twice now — the first time when it screened at the Toronto International Film Festival last year — it remains her only film that has left me cold, even as I can't seem to quite shake it. The reason, largely, is Josh, the least personable character that Reichardt and Raymond have ever crafted, particularly as played by a taciturn Eisenberg. After carrying out their plot, Josh, Dena and Harmon, never particularly united in the first place, separate. Each is left alone with their own consciences, their own moral compasses, and the audience is increasingly left alone with Josh, whose suspicious, gloomy expression hardly changes throughout and who, to the end, remains unknowable. This impenetrability perhaps is meant to position Josh as a lost soul fighting for a lost planet. But in the film's final third, the inscrutability feels more like a miscalculation through overcompensation: In its aim to tamp down Eisenberg's neuroticism and have him offer slow drips of revelation rather than bursts of loquacious energy, Night Moves keeps too much hidden from view. The more Josh and the film retreat from the group, the more it asks pivotal questions about ethics, about how exactly one ought to fight for a more hospitable world, both politically and environmentally. In Josh's face, however, we find little insight and too many blank stares.